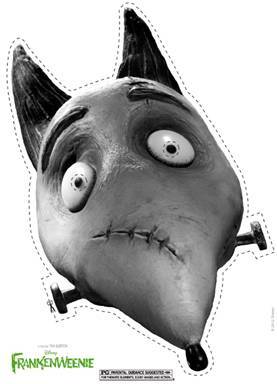 I’m excited to share these Halloween masks of your favourite Frankenweenie characters! Just download and print for your little ones. So cute! I’m going to wear one myself LOL. haha i love this thanks!! We are so going to see Frankenweenie, thank you for the sharing the site to download the mask. I’m going to print off a few of them..
LOL I think both of my dogs are going to wear these to great Halloweener’s at the door. I just saw Frankenweenie a couple weeks ago, Good Flick. lol. looking forward to this one. Lol this is cute,thanks for the downloads of the Frankenweenie masks.